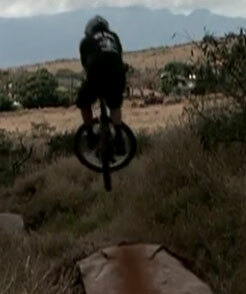 Maui mountain bike image trail riding in west Maui. You haven't booked that cycling vacation to Maui yet? Will there be enough riding on Maui to keep your interest? Not sure you'll be challenged enough? With 7 unique micro climates and a 10 thousand foot volcano to ride down (or up! ), every style of bike riding is available on Maui! From extreme mountain biking terain challenging enough for the XTerra world championships and with one of the world's toughest road bike challenges in the 10K feet climb to the top of Haleakala, you'll have more difficulty deciding if you should road bike or go mountain biking than finding challenging bicycle rides. Still not convinced a cycling vacation on Maui should be on the bucket list of every bicycle rider? Take a look at the following two bike videos before you book your next bicycle vacation! Haleakala bike ride image of Outside Magazine Ride Guide TV Team Norco bike down Haleakala. Already set up with a bike but don't know where to ride on Maui or looking for others to enjoy bicycling with? Join a group of riders on Saturday mornings for a fun ride led by Maui cycling enthusiast Mike Cordoza. The bike ride begins at 7:30 am on Saturday mornings from West Maui Cycles bike shop in Lahaina. Note: If you need a bike rental for the ride, be sure to pick it up your bike before we close on Friday afternoon at 5 pm. The bike shop opens at 9 am on Saturdays. Keep up with th latest Maui bike info by subscribing to our Maui bike blog.